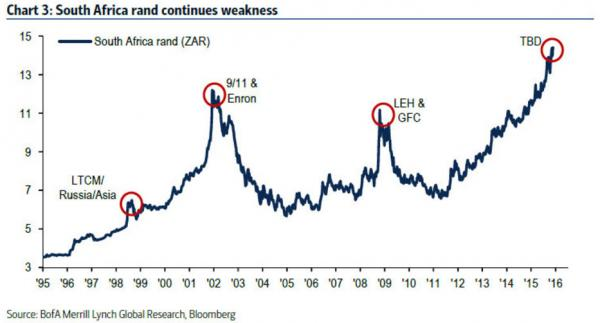 And just to be Captain Obvious, the chart is inverted as the South African Rand is not exactly a bastion of strength in light of the continued run on commodities. Inverting a chart allows for an alternative perspective, which we know is needed more than ever in these days of literally any trading edge being arbitraged into oblivion within a co-located microsecond. We’ll have to wait and see if Rand correlation to world markets continues to lead up to major market events, but there is no denying the importance of currency analyses in a macro outlook. Speaking of Captain Obvious, this inverted Rand chart made me want to take another look at an inverted chart of the USD. I keep reading perspective after perspective about how the tightening of the US currency will lead to continued strength in the dollar as the US continues to be the strongest developed economy in the world. Safety, safety, safety will drive the USD trade according to expert analysts. This is in light of the fact that trader commits have already been showing some backing off in the long USD trade. I am by no means an expert in currency trading, or for that matter, examining international capital flows. However, I pulled up an inverted monthly chart of the USD over the last 15 years and included a couple of indicators that I rarely use. The top indicator is the standard Ultimate Oscillator (ULT) with default periods of 7, 14, and 28. 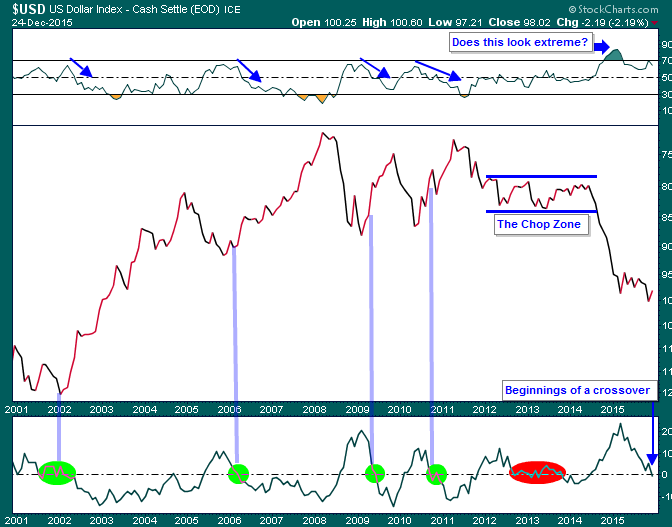 The bottom indicator is simply the 9-month of Rate of Change (ROC). There were some potentially telling relationships. As denoted by the green circles, trouble was usually on the horizon once the ROC worked its way up to 10 or higher and then back down to crossover the zero-line. The lone exception over the last 5 occurrences was the late 2012 to early 2014 consolidation with heavy chop. Recently, the 9-month ROC just began to crossover below the zero-line again. The ULT follows a similar path in that once it has breached a reading of 60 or higher and then began to work its way downward, USD price action generally began to deteriorate. Observe the price action in the dollar at each of the downward sloping blue arrows. Despite what the indicators have proven to communicate on previous occasions, this is an obvious case of data mining and thus cannot be truly relied upon for making large scale investment decisions. None the less, I found the observations interesting as part of a larger overall analysis. There are many highly-correlated relationships recognized between currencies and asset classes. Some of the obvious ones are the USD and commodities (inverse), CAD and AUD and commodities (direct), Yen and SPX (inverse), but it’s the dollar’s relationship with the Swiss Franc and gold that has me intrigued for a potential move. The franc and gold have a long documented relationship of synchronous movement. Not perfectly, but with consistently high correlation. While the dollar tends to move opposite the franc and gold. Again, not perfectly but with consistent negative correlation. Observe this time-tested relationship for yourself. Could the action be telling market players to expect some fireworks in the USD, franc, and gold in the first half of next year? There are a multitude of low-risk ways to go long or short the currencies using futures, ETFs, and options. I leave it up to the reader to decide how to potentially risk any capital. Another relationship to watch out for due to USD correlation, is the ratio of the S&P 500 index to the CRB commodities index. Kimble Charting Solutions pointed out the “Eiffelesqueness” of this particular ratio. With the world economy continuing to slow down, it does appear as if there is no hope for iron ore, oil, and copper but we are at multi-year extremes and a close eye is warranted. They’re called counter-trend rallies and the adroit can exploit. I hope you had a wonderful Christmas and I sincerely wish that 2016 truly brings good tidings to all Margin Rich readers…and profits, too! Thanks a lot for another great post! I use correlation a lot in my trading and it is always interesting to see another take on the subject. As I trade forex pairs, I mainly watch the correlation between 8 major currencies, their economies (including stock indexes) and major commodities (especially when analyzing CAD, AUD and NZD). Gold chart indeed looks very interesting. 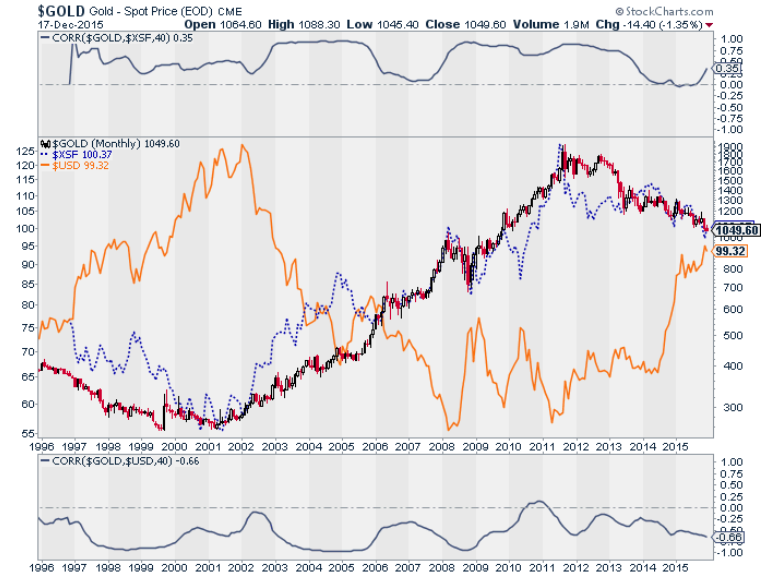 I would add that latest in CFTC COT data we are approaching a net short level in large speculator positioning in Gold. When one side of the market gets overcrowded, it is certainly not the one I want to participate in. Provided, technically I would still not buy gold, but given USD (very moderate) reaction to FED hike something interesting might happen in the next couple months, and it could involve Gold, USD and CHF. If Oil joins the part of changing global trends, AUD, CAD and NZD will be also very interesting currencies to watch. Once again, thanks for another great article. My pleasure. Thanks for being a loyal visitor.